I saw this deal yesterday at Decathlon store in Bolton, and I thought it could be interesting bike for some cycling enthusiasts here. However I'm not sure if it's a national deal. Heat given, seems like a good price although a more realistic one considering the carrera range around the 329.00 price point. These are a good spec @ £590 so at £300 it's a true bargain, the fork costs around £200 alone. Heat given, seems like a good price although a more realistic one … Heat given, seems like a good price although a more realistic one considering the carrera range around the 329.00 price point. This spec is way above and beyond the £300-£400 carrera range. When I was looking for a bike couple of months ago I was told this bike was one of the best specs at its price point which was £480, I never did but it though so might have a look in the Sheffield store see if they have it at this price. great bike for that price! The frame weighs 1.8kg? Whats the bikes whole weight then, must be feather light. I though mine wasn't too bad at at 15 kg. Obviously not! ahh it says up there, 12.8kg. Lovely. I've been riding a RockRider (think it's a 5.1) for 2 years every day for a 2 mile commute and often for 10 mile+ trail rides. The reliability of the bike has been unbelievable. Changed the brake pads a couple of times and only recently had to change the rear tyre (the front still has tread). All mechanical parts; gears, front suspension, brake system all still work fine. For anyone who's not into cycling big-time but would like to get fit, I can't recommend a Decathlon bike highly enough! Insane spec for the price. You could split it for parts and make a tidy profit. Utter bargain. Super-hot if you can get one in your size. Would you recommend this or the GT avalanche 3.0 that was advertised the other day? Would you recommend this or the GT avalanche 3.0 that was advertised the … Would you recommend this or the GT avalanche 3.0 that was advertised the other day? I have the new 2012 version of this bike, Its really really great value and this is easily worth the money. Nice one, or not, dependant on if you are my bank manager or not ! Bolton has confirmed that they only have XL left in stock. That is an incredible price for a great piece of kit. Wish there was a Decathlon near me! Not on sale at teh Nottingham Decathalon - Bolton store specific? I bought a Cube Acid 2012 back in April for over £700 - this bike has a spec comparible to that including same fork for well under half the price - bargain! Great spec at a great price so heat added where its deserved :-). Smalls available in lakeside. 1 Large available in France however. Good forks even the cheaper silver model recons are pretty good. Any idea what brakes they are? Hydraulic Shimanos maybe? If your a bit of label nancy you could always get a decent 2nd hand frame of ebay and swap the parts over if you fancy a project. Heat from me. Great spec at this price. Very light bike for this sort of money and should be durable. I own this bike; paid £499.99 on C2W and thought it was a bargain at that price. It really is a great bike for the budget minded; light and a great ride. Good forks even the cheaper silver model recons are pretty good. Any idea … Good forks even the cheaper silver model recons are pretty good. Any idea what brakes they are? Hydraulic Shimanos maybe? If your a bit of label nancy you could always get a decent 2nd hand frame of ebay and swap the parts over if you fancy a project. Heat from me. They're Avid Elixir 3's. Awesome stopping power. Who cares if you get £200 less when you sell it if you paid £200 less when you bought it?! As mentioned above you could buy the bike and just put the parts on a nicer frame as £300 would be good just for the components. If you got ANYTHING back on selling the frame its a bonus. This is a great bike for the price, but is last years model. I have just bought the new 2012 model and it looks much nicer. Blue and matt black, looks really classy. They have upgraded the tyres to Michellin flexi bead tyres too. 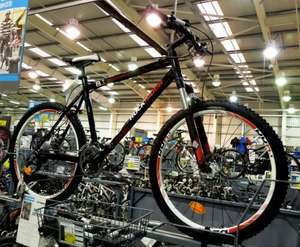 Priced at 499.99, you will not find a higher spec bike for the price. The servie at my local Nottingham store was also brilliant, really helpful, knowledgable staff!! Why didn't u go through the cycle scheme as well?